The Outdoor Wire has obtained a memorandum telling magazine distributors servicing Kroger stores nationwide that “after much consideration” Kroger has decided to remove the Assault Weapons magazine category from all their retail locations. As of 2015, Kroger currently operates 2,782 grocery stores in 35 states under nearly two dozen banners. Distributors for the stores have been given a two-week timeline to accomplish the removal. The memorandum goes on to explain that new mainline category flow charts reflecting gun title placements will be provided for “resets, remodels and new stores”. The instructions also direct workers to conduct a short survey in order to “ensure” the removals are accomplished in each of Kroger’s locations and provide verification of the changes. 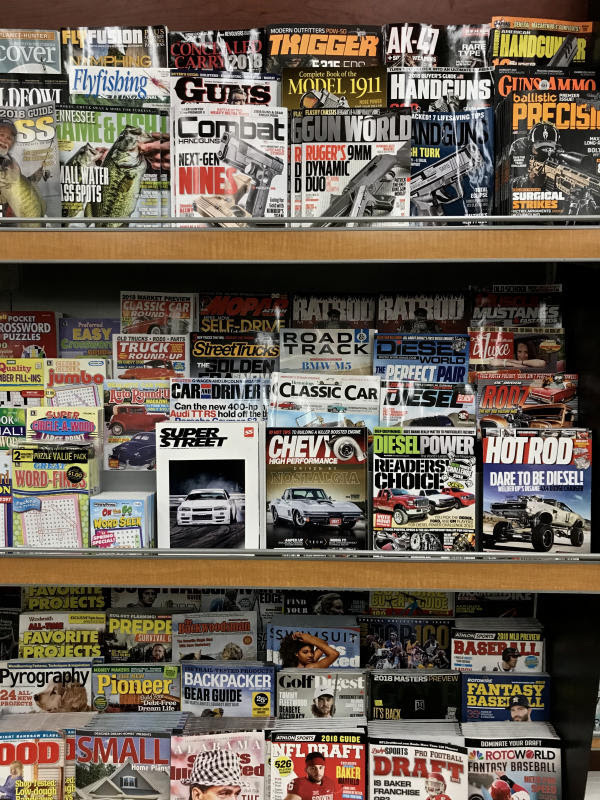 Removal of the magazines by Kroger removes the entire category from the shelves of America’s second largest retailer. With locations in 34 states, Kroger represents a major chunk of magazine distributions. The memorandum specifically covers Kroger locations, and there’s no mention of the 786 convenience stores also owned by the supermarket giant. An accompanying list detailed the initial 57 specific publications to be removed. The list includes familiar titles: Guns & Ammo, Guns Magazine, Firearm News, Military Surplus, Modern Firearms, On Target, Recoil, Rifle Shooter, S.W.A.T., Special Weapons, Tactical Firearms, Gun Buyer Annual, Gun Guide, Gun World, and World of Firepower. All told, fifty-seven distinct UPC coded publications will be pulled. Looking at the list, it seems to be guided by a fairly simple baseline: if it mentions the AR-style rifle, it is set for removal. Those removals include annuals, buyer’s guides, special editions and other titles. A typical Kroger Newsstand (above) will soon be missing several of today’s prominent gun titles (below). Jim Shepherd/OWDN photo. Athlon, FMG, Outdoor Sportsman Group, Krause, Engaged Media and other publishing groups will all have titles removed by the removal. We do not know if they’ve yet been made aware of the Kroger decision. Attempts to reach senior Kroger officials at their corporate headquarters in Cincinnati, Ohio, for comment were unsuccessful as of our publishing deadline last evening. This decision seems to place Kroger wholeheartedly in support of the nationwide protests against AR-style rifle, despite the likelihood that a significant number of Kroger customers may be AR owners. The removal also indicates that Kroger has evaluated the impact of the decision and decided the positives of the removal outweigh the negatives. What, you may ask, is the big deal about a single grocery chain deciding to remove magazines? Simple answer: in many locations, grocery stores are essentially the only remaining newsstands of any size and comprehensive variety. They’re the single best link between publishers and their potential readers. If your titles are removed, you lose the potential to reach those readers. Without those sites, your distribution universe is also diminished. Lower distribution means lower revenues and already-tight numbers become even more constricting. His answer was one that interjected another consideration into the discussion. In that light, it is absolutely Kroger’s right not to carry any product. That seems pretty cut-and-dried. By the same token, it is also the right of Kroger’s customers to express their displeasure at the decision, either by expressing their concern - or taking their business elsewhere. Ultimately, the customers decide what products any store needs to carry.